Etel Adnan is a poetess, novelist, essayist and visual artist born in 1925, in Beirut, Lebanon, to a Muslim Syrian father and a Christian Greek mother. After attending a Catholic convent run by French nuns in Beirut, Etel traveled to Paris where she received a degree in philosophy from the Sorbonne. In January 1955 she moved to the United States to pursue postgraduate studies at the University of California, Berkeley, and at Harvard University. From 1958 to 1972, Adnan taught philosophy at Dominican College of San Rafael, California. She has also lectured at several universities throughout the USA. After returning to Lebanon in 1972, she worked as cultural editor for for two daily newspapers, first for Al Safa, then for L’Orient le Jour. She left the country in 1976. Though she grew up in a primarily Arabic-speaking society, French became the language in which her early work was first written, while most of her later work has been first written in English. Caught between languages, her interest in visual art developed during the years of the Algerian war of independence, when writing in French had political implications which the artist, out of solidarity with the rebels, refused to accept. She shifted the focus of her creative expression to visual art, and became a painter. Her first artworks date to 1958, at a time when Adnan had already moved to the Sausalito, a San Francisco Bay Area city in Marin County, California. Although primarily a writer, Etel leaves her paintings untitled because she feels that the words might taint their innocence. Etel Adnan paints in oil paint with the canvas laid on a table, using a palette knife to apply the paint onto the canvas in firm swipes across the picture’s surface, often directly from the tube. During her stay in Sausalito, Adnan began to focus on the surrounding landscape, inspired by the Mount Tamalpais, the highest peak overlooking San Francisco Bay which was visible from the windows of her home. The mountain became a permanent reference point which she depicted repeatedly in her paintings, capturing its ever changing moods and dynamic at different times of day, throughout the years. Over the years she has expressed her love for this mountain by dedicating books and poems to it, culminating with 1986 book, Journey to Mount Tamalpais, described as a meditation on the links between nature and art. 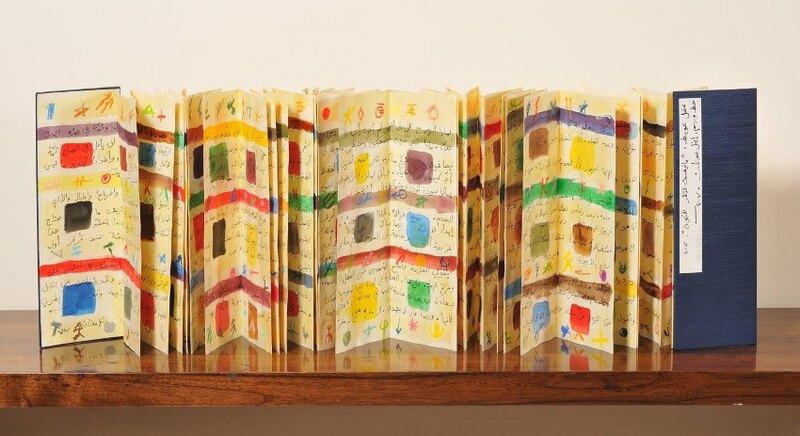 Alongside painting, since the 1960s, she has painted, drawn and made leporellos, pocket-sized fold-out books. The leporellos combine verbal and visual observation and are splendidly illustrated, filled with landscapes and transcriptions of Adnan’s own writing as well as of Arab poetry by writers such as Mahmoud Darwish and Yusuf al-Khal. Etel Adnan also makes tapestries which translate the vivid colours of her paintings into wool. Many of her tapestries are in public spaces and private collections, including the Contemporary Crafts Museums of New York and Los Angeles. Etel Adnan retired from a permanent teaching position in the late 1970s and devoted herself to art and writing. A powerful voice in feminist and antiwar movements, Adnan has published many works of poetry and fiction, among which are The Arab Apocalypse, 1989, Of Cities and Women, Letters to Fawwaz, 1993, and Master of the Eclipse, 2009. One of her most notable novels is Sitt Marie Rose, first published in 1977. Set in the civil war in Lebanon, the book deals in dramatic terms with the issue of religious and political integralism and the role of women in Lebanese society. Winner of the France-Pays Arabes prize in 1977, Sitt Marie Rose has been translated into more than 10 languages, becoming a classic of War Literature. In the late seventies, she wrote texts for two documentaries made by Jocelyne Saab, on the civil war in Lebanon, which were shown on French television as well as in Europe and Japan, and several theatre pieces, including Comme un arbre de Noël, and L’actrice. She worked on a film about Calamity Jane in collaboration with Delphine Seyring, and a musical work with her Love Poems. Many of Adnan’s poems have been set to music, for example by Gavin Bryars Adnan Songbook and by Zad Moultaka Nepsis. Etel Adnan has participated in numerous solo and group shows worldwide. Her work was recently presented in the solo exhibition Etel Adnan in All Her Dimensions at Mathaf: Arab Museum of Modern Art, Doha, Qatar, 2014, and was included in the Whitney Biennial, New York, 2014, and Documenta 13, Kassel, Germany, 2013. 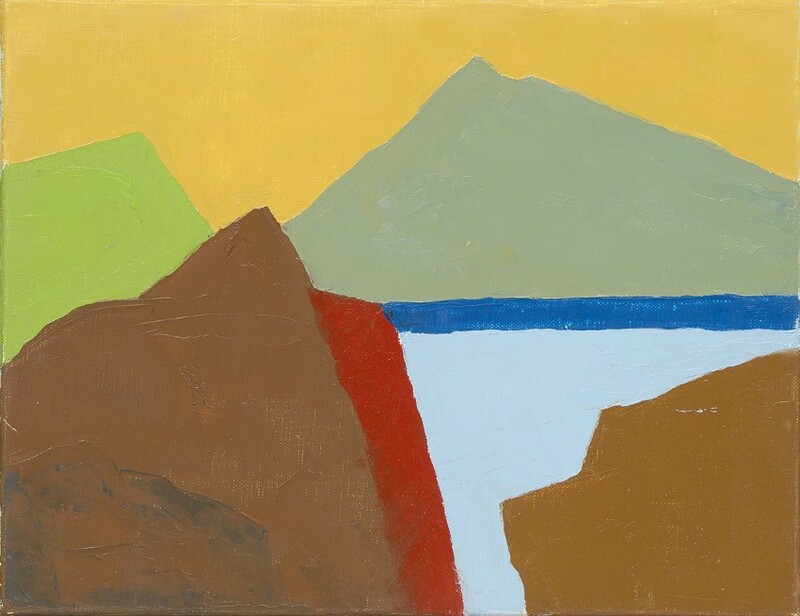 Etel Adnan’s had her first solo show in China at Galleria Continua Beijing in 2014. 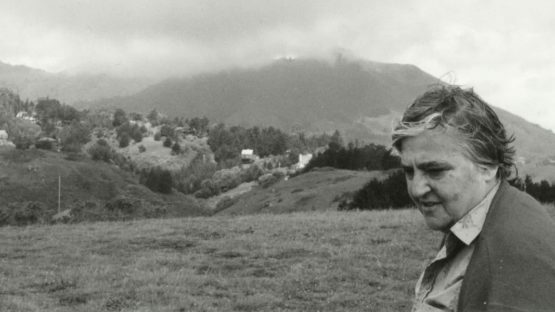 Etel Adnan received many awards for her contribution to culture, including the Arab American Book Awards for Master of the Eclipse in 2010, the California Book Award for Poetry for her collection Sea and Fog in 2013, and RAWI Lifetime Achievement Award from the Radius of Arab-American Writers, among others. In 2014, Adnan received France’s highest cultural honour, the Ordre de Chevalier des Arts et des Lettres. Etel Adnan has works in many notable private and public collections including the Royal Jordanian Museum, the Tunis Modern Art Museum, the Sursock Museum in Beirut, the Institut du Monde Arabe in Paris, the British Museum in London, the World Bank Collection in Washington D.C., the National Museum for Women in the Arts, Washington D.C., among others. 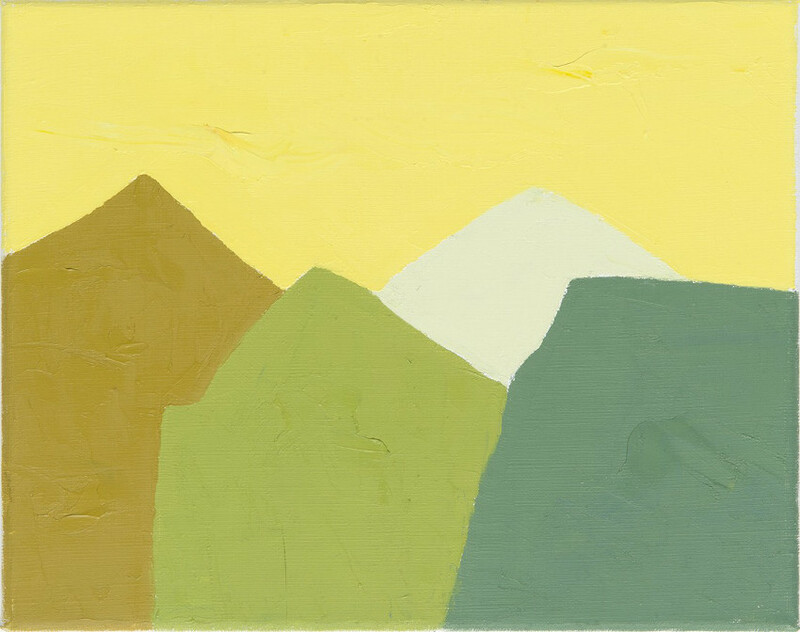 Etel Adnan lives and works between Paris, France and Sausalito, California.